Overcoming a massive practice crash, quickly preparing a new car, and a daring race strategy call were just a few of the highlights on the way to an amazing finish at the team's home track. The two BimmerWorld/Gearwrench cars started back in the field but strategy, consistency and some luck led to a strong finish. Due to contact on Thursday’s test day, the #80 BimmerWorld/GearWrench car was out of commission. Luckily, RRT Racing came through with a backup car for the weekend. 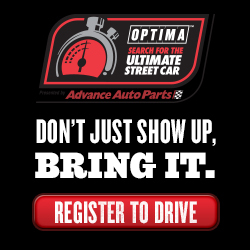 If BimmerWorld’s maiden season in the GRAND-AM Continental Tire Sports Car Challenge was the subject of a reality show, viewers of the series would agree that each episode keeps getting better and better. For starters, the opening episode at Round 1, held at Daytona International Speedway, produced an amazing finish of second-place for the #81 BimmerWorld/GearWrench BMW E90 driven by Seth Thomas and Bill Heumann. Episode Two, at the Miami-Homestead circuit, brought the BimmerWorld/GearWrench team slightly down to Earth, as the #81 took fourth and the #80 BMW E90 of James Clay and David White finished in seventh-place. Episode Three at Barber Motorsports Park held early promise when David White earned his first career series pole position, but with the track configuration playing right into the hands of their rivals, the team was forced to settle with a fifth and sixth-place finish with their two-car assault. Episode Four, held last weekend at Virginia International Raceway — the home track for Dublin, Va.-based BimmerWorld — had a season’s worth of drama and excitement packed into a single event. Records will show that the #81 of Thomas and Heumann earned another podium with a second-place finish, and that Clay and White’s #80 landed in sixth-place, but how the two cars arrived at their respective finishing positions hardly went according to the script. We’ll begin with the #80, which started out on Thursday as BimmerWorld’s usual #80 BMW E90, but come Saturday, Clay and White were still racing the #80, but not the #80 owned by BimmerWorld. Huh? What? 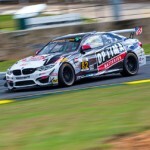 A deal was quickly made with the RRT Racing team to rent their BMW E90. With the usual camaraderie and spirit within the GRAND-AM paddock, RRT aided BimmerWorld’s immediate needs and with the ‘surrogate’ E90 in hand, BimmerWorld’s peerless team of technicians began the foreboding task of ‘BimmerWorld-izing’ the RRT E90 to their specification. With the replacement #80 ready to go, David White says getting used to a ‘new’ car took some time prior to the race, but with the team’s guidance, it was business as usual when it came time to buckle in and start the race. Achieving a sixth-place finish isn’t normally something Clay’s team would be satisfied with, but after the harrowing events leading up to the race, they’ll make an exception. As if the #80’s storyline wasn’t exciting enough, the #81 came home in second-place gasping for fuel and sputtering across the finish line, thanks to a masterful plan hatched by BimmerWorld’s race engineer and strategist, Wayne Yawn. Not to mention the masterful and fuel-miserly drives by Seth Thomas and Bill Heumann. Thomas says he drove with faith that they had enough fuel to make it to the finish line…but he still couldn’t believe he had to stretch a tank of fuel as far as he was being asked to. 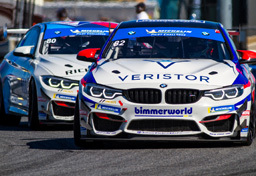 With two podium finishes from four races, Thomas and Heumann continue to forge an amazingly strong and productive partnership behind the wheel of their BimmerWorld/GearWrench BMW. Heumann says that with similar goals and personalities, their partnership is equally as strong on and off the track. With the 2010 season almost at the halfway point, Thomas and Heumann sit second in the drivers’ standings, the BimmerWorld/GearWrench team holds second in the teams’ championship, just six points behind the 2009 ST-class winners, and Clay and White have also marched up the driver’s points after being taken out at Round 1, and are now tied for 11th, all in the team’s first year in the series. Who knows what Episode Five will have in store for the team in five week’s time at Lime Rock Park, but after the dramas this past weekend, James Clay says he wouldn’t mind it if the plot was a tad bit boring going forward. Tune into SPEED on May 1st at 1 pm E.T. to watch BimmerWorld’s amazing performance at the Bosch Engineering 200 from Virginia International Raceway, and follow the team’s progress at www.BimmerWorldRacing.com.